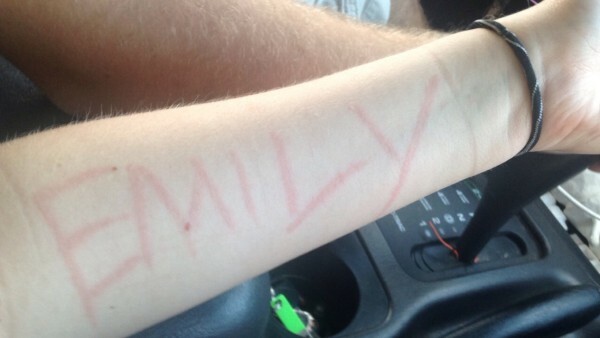 “My name is Emily, I’m 17 years old and I live in Missouri. I will be starting my senior year of high school this fall, and hope to be an English teacher when I grow up. I started noticed the bumps on my skin about a month before my diagnosis. They were white, and looked like hives. When I itched them, they spread. One bump could quickly turn into thirty. It was quite painful for me for the longest time because I just couldn’t seem to stop itching. My mom determined that I was having an allergic reaction, but to what is the real question. I had no changes in my diet, nor in laundry detergents or soap. Nothing had changed, so I didn’t understand why my body was. Finally, we decided to get a doctors opinion. I thought that they were just going to tell me that it was an allergic reaction and to take Benadryl if it got too bad, because that’s what I had been doing. Immediately after talking to the nurse about my symptoms, he said he thought he knew what it was, but he was going to let the doctor check first. A couple minutes later I got my final diagnosis. It was dermatographia. I had never heard of it before. I kept asking questions such as “why did it just show up?,” “will it go away?” No one could really give me a straight answer, because they said most of the time you really just don’t know. I am so happy to hear you say that Emily! It’s so refreshing to hear your story of embracing your skin, being unique in this world that’s so mundane sometimes. Cheers to that! 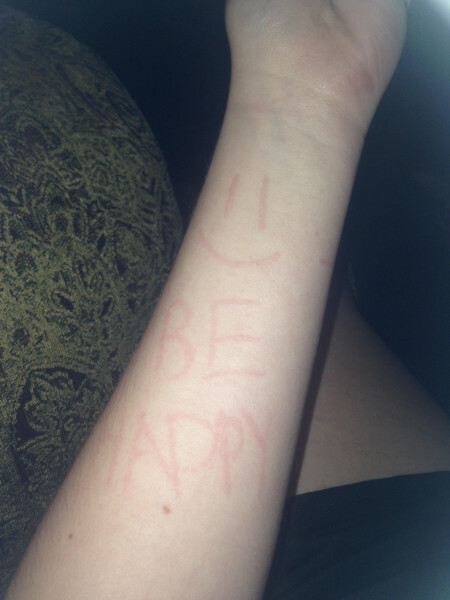 Emily and I have been corresponding for a couple of weeks, ever since she sent me the above story and some awesome photos of her dermatographia. I asked her a few more questions, and learned that she’s a budding artist thinking about incorporating skin imagery into her paintings. Ariana Page Russell (APR): Please tell me a little bit about you. What do you like to do, what are your interests, etc.? Emily Hayes (EH): I’ve never been one to stay with one hobby for awhile. I’m constantly trying different things, or trying to learn new skills. This past year, I’ve taken up painting and have fallen in love. I’ll turn up my “Weezer Radio” station, and just paint. Most times, I’ll start at night and won’t stop until the sun comes up. (APR): Ha ha I used to listen to Weezer in high school too! But that was when they first started out. So funny how certain types of music really stick around. Do you take anything for your dermatographia? (EH): When first diagnosed, I took a steroid for about a week. Just something for my body to fight it off for a little. Now I take an allergy pill every morning, and a benadryl if I start to break out too bad. I keep itch cream handy wherever I go, and it’s been my lifesaver. (APR): That’s great you found something that works for you! You should try coconut oil sometime too. (Everyone who reads Skintome knows I’m obsessed with coconut oil lol). Now that a lot of your friends know about your skin, does it make you feel more comfortable sharing about dermatographia? (EH): I’m still not 100% confident, and don’t think I’ll ever be. I’m young, and still in my “I care what people think” stage. But I’m more than willing to talk about it with someone who has questions. No use in trying to pretend like it’s not there. (APR): That sounds like a great attitude to have! And trust me, you’ll totally come out of that stage… especially since you’re already so self-aware at such a young age. What do people think about your skin once they find out about your dermatographia? (EH): I’ve gotten different reactions. My coworkers are constantly asking if they can write their name on my arm, or if I could draw them a picture. Some of them have been my biggest supporters. But some people are a little worried about it. I don’t blame them, I was pretty worried at first too. The main thing I get is people freaking out thinking it’s contagious, and if I touch them they’ll have to be put into quarantine or something drastic like that. Do you find your skin inspiring? (EH): I don’t know if inspiring is the word. I’m still regular ol’ Emily. But now I’ve just got some extra flare to me. I’m definitely going to strive to reach out to people my age who are self conscious about their bodies. (APR): Awesome news! We need more strong voices for staying positive about dermatographia! How do you think dermatographia will affect the way you live your life from here on out, for example, the way you take care of yourself or what you do in your free time? (EH): I’ve read a lot of articles saying that eating healthier and exercising will help with breakouts. I hope eventually (when I find the motivation) that I can change my diet and living ways, to where I can be the healthiest possible. (APR): You’re lucky to discover this at such a young age! Starting a healthy lifestyle now will help you live a long and healthy life. Is there anything you’d like to know about dermatographia? (EH): There is so much. I’m still clueless, and the only information I’ve gotten is over the Internet. I’m still curious on how it just randomly showed up one day, with no evidence of it before in my lifetime. That’s probably my biggest question. Thanks for the interview, Emily! I’m so glad you found us here! My back and stomach also react very well to scratches, but I don’t know if that has to do with the sun. I was thinking it’s because my skin is thinner and more sensitive there. Awesome thanks for sharing your story! Welcome to Skintome, please let us know how things go for you and your dermatographia :^) Glad you found us! Ha! It’s a good thing she never reported you or anything! Thanks for sharing. Glad to hear your experience of dermatographia is a mild one 🙂 You have a great attitude about it! Great story from a fellow Missourian! I’ve been having fun with my Dermatographia since 1966. Its great for parties! I’m lucky as the only symptoms I have are the skin swelling; no itching or pain. Thanks for sharing your story!